Make your carrying bags standout! Carrying bags such as travel luggage, women handbags, children backpacks, men suitcases, trunks among others can sublimely be showcased through high definition photos and interactive animations. Luggages are very large bags which are quite heavy. If previously you had to transport your luggage to a professional photographer every time you needed some visuals and you had to bear the cost of transport, the cost of lighting setup and the cost of the photographer, now, we have the perfect solution for your problem. 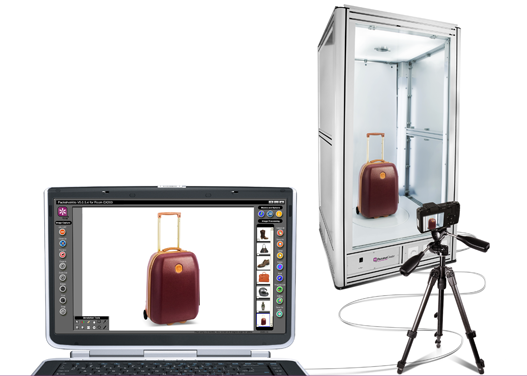 You can internally produce your luggage photos with the intuitive PackshotCreator photo studio. Thus, the production process is greatly simplified as it helps you save time and money. High definition photos of your luggage can easily and swiftly be created for your e-commerce website. You can easily create interactive animations such as 3D animations and 360-degree animations of your carrying bags. With four symmetrical lightings, no unnecessary reflections and cast shadows are caused. You can update your website’s photos and animations any time you want. Potential customers will be attracted to your interactive website and the rate of customer conversion will definitely increase. Size and weight of your carrying bags are not a problem with the PackshotAlto photo studio. You have a competitive edge with up-to-date quality photos and animations on your website. Make your bags standout with the digital PackshotCreator office studio!